Formed in 1941, the Philadelphia Fellowship Commission is the nation’s largest private metropolitan human rights organization. At the time of its inception, the Fellowship Commission was made up of four constituent agencies: the Philadelphia Anti-Defamation League (later the Jewish Community Relations Council), Fellowship House, the Race Relations Department of the Philadelphia Federation of Churches (now the Metropolitan Christian Council), and the Friends Committee on Race Relations (of the Religious Society of Friends). These four original constituent agencies were later joined by other notable civil and human rights organizations, including the Philadelphia Branch of the National Association for the Advancement of Colored People (NAACP) in 1942 and the American Civil Liberties Union in 1952. Initially, the Fellowship Commission grew out of various organizational efforts to combat antisemitism in Philadelphia and, particularly following World War II, discrimination and prejudice in the city more generally. In the 1940s and ‘50s, the Fellowship Commission devoted itself to eliminating questions of race and religion on school and employment applications, as well as removing racial and religious restrictions from newspaper and real estate advertisements. During the Philadelphia Transit Company strike of 1944, the Commission played a key role in promoting the peaceful acceptance of black workers into the company union and achieved a major victory in 1948 when the Republican-controlled Philadelphia City Council passed the Fair Employment Practices Ordinance. 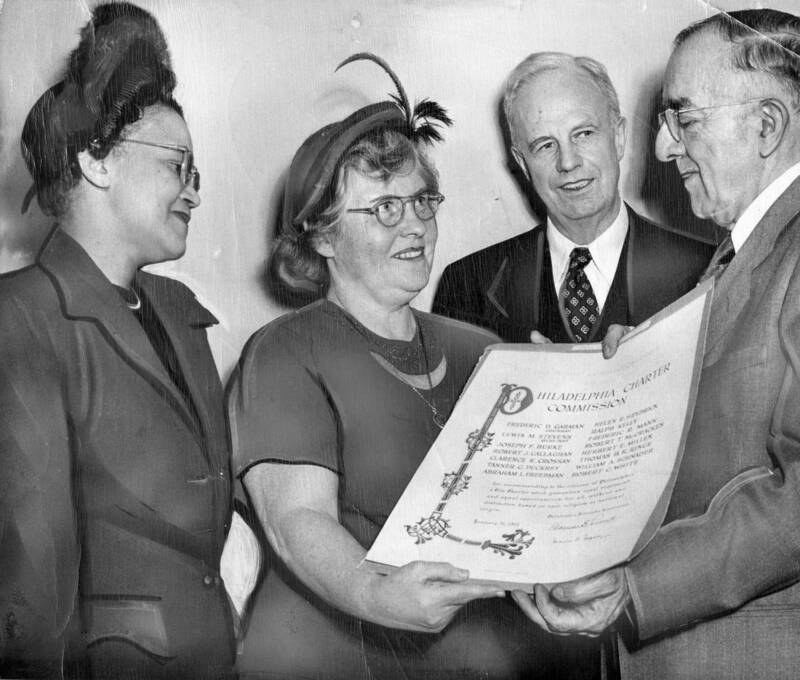 In 1951, the Fellowship Commission added to its early achievements, successfully leading a campaign to include a ban on racial and religious discrimination in all municipal employment, services, and contracts in Philadelphia’s new Home Rule Charter. The 1951 Home Rule Charter also provided for the establishment of the Philadelphia Commission on Human Relations, a city agency tasked with enforcing Philadelphia’s anti-discrimination laws. In the coming decades, the Fellowship Commission often partnered with the Commission on Human Relation to promote more equitable hiring practices across Philadelphia industries and also undertook various initiatives to expand educational opportunities and quality integrated education. In the area of education, signal achievements included helping pass the Pennsylvania Fair Educational Opportunities Law in 1961 and co-sponsoring the Philadelphia childhood project to study racial inequities in education. Notably, the results of the Philadelphia childhood project were later cited by the United States Supreme Court in its seminal Brown vs. Board of Education decision in 1954, which ruled public school segregation unconstitutional. While the Fellowship Commission’s constituent agencies tended to focus on a certain field or cater to the needs of a particular group, the Fellowship Commission itself aspired to address the shared interests and concerns of its member organizations. To facilitate the study of such interests and pinpoint potential courses of action, the Commission established several standing committees, which brought together community members, experts in various fields, members of the constituent agencies, and Fellowship Commission staff in working sessions. Over the course of the 1950s and ‘60s, the standing committees came to include the Education Policy and Planning Committee (EEPC); the Committee on Higher Education (COHE); Committee on Community Tensions (CCT); Committee on Employment and Economic Security (CEES); Health Policy and Planning Committee (HPPC); and the Committee on International Human Rights (CIHR). Through these standing committees, the Fellowship Commission increasingly became involved in drafting, evaluating, and advocating civil rights legislation and became a central player in key Philadelphia civil rights campaigns, such as the effort to integrate Girard College in the 1950s. Following the August 1964 Columbia Avenue race riots, the Fellowship Commission was also instrumental in promoting reconciliation between North Philadelphia’s African-American residents and Jewish business-owners and led several symposiums on the violence that rocked Northern cities throughout the summer of 1964. In later years, the Fellowship Commission continued its efforts to promote equality and protect individual rights, pursuing issues of affirmative action, capital punishment, gun control, and prison reform among others. To view primary source materials about the Fellowship Commission and other topics in Philadelphia's civil rights history, search our collections.